Sea Turtles. This is an amazing story from the Los Angeles Times, about a colony of more than a dozen giant sea turtles that have found a home in the San Gabriel River, in the heart of Los Angeles, a few miles upstream from the port of Long Beach. The sea turtles, farther north than their tropical range, are attracted by the warm water discharge from a power plant. The poor water quality doesn't seem to disturb them. The giant sea turtles can weigh up to 500 pounds and live for as long as 100 years. Maybe the turtles know something. Or maybe they just want to be in LA. Meanwhile, Hurricane Gustav is bearing down on the Gulf Coast. I just emailed a friend in Floresville, in South Texas -- she lives on high ground and 150 miles inland -- safe from the highest winds, but likely to be drenched by heavy rains if it steers toward that part of Texas. But if if it heads toward Houston or New Orleans, Floresville and all the other inland communities will warmly welcome thousands of storm refugees. Gustav might cause enormous property damage, depending on where it makes landfall. But the mass evacuations should minimize loss of life. Up here, in the Skagit Valley, we have a lot of soggy wheat. Wheat is not the main crop, but the farmers doubled their acreage this year to take advantage of high global prices. They will still get this high price, but the unexpected August rains have made the harvest more difficult. If grain is harvested when its damp, the farmers have to put it through a dryer to get the moisture out, and that's an extra cost. But if the wheat is completely wet, as it is right now, the thresher will get all gummed up, and they just have to wait for some sunshine. I'm not smart enough to be a farmer, but I hear things. Alaska Governor Sarah Palin calls her husband the First Dude. She's exciting and interesting -- has that "naughty librarian" look. And fully qualified in my mind. If you can raise five children, you can chair a meeting of the Cabinet -- I'm not kidding. She might confuse Bulgaria with South Ossetia -- but you can learn that stuff. Anyway, I have heard on the Internet, that McCain and Palin are in Jackson, Mississippi, right now to lend a hand with the hurricane evacuation. Okay -- but if they do the slightest bit of grandstanding about the wonderful volunteer spirit of the Republican Party -- well, they just better watch what they say and do. If you can't help, get out of the way. John McCain may have picked her because she's shorter than he is. McCain is 5 foot seven inches tall. The candidates' height is part of a long list of things that shouldn't matter, but they do. But I don't think McCain chose her for strategic political reasons, or for height reasons, actually. This was McCain-as-maverick, saying what-the-hell, let's wing it, and this might be fun. He's right about that. It will be fun. But now, as I think about it, when people say they miss the old maverick McCain -- I don't want that quality in my President. I want a careful thinker -- with some imagination, just not too much. 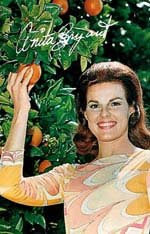 Many people have compared Sarah Palin to Anita Bryant, she of the orange juice advertisements and the anti-homosexual crusades -- you younger readers can look up Anita Bryant for a reprise of those historic moments. But, aside from these snarky comments, I will make no criticism of Gov. Palin. Hear her words. Let her speak for herself, and form your own opinion. As for experience and the lack of it, I have wanted a new face all along, and I found my new face in Barak Obama, so I can hardly deny the Republicans their own new face. In fact, I have been bored to death with all the commentary attending the Democratic convention. If I ran a newspaper or a website, I would simply publish the unedited speeches. I heard Michelle Obama say that she loved her husband and she believed he would make a good President -- I did not need an interpretation of her words. I heard Hillary Clinton endorse Barak Obama --- I took her words at face value. Heard Bill Clinton give a joyful speech, and I realized that no one ever enjoyed being President as much as he did -- Ii think he really misses having that job, and I hope, for his sake and for the sake of the country, that he can found another path of public service. I heard Barak Obama speak last night, and he did very well. He's my candidate, and he's six-foot one inch tall. Why can't the Olympics last forever? France, China, and America are the three essential nations of the global community. The three official languages of this year's Olympics are Chinese, English, and French. Zimbabwe President Robert Mugabe flew all the way to Hong Kong, but the Chinese gov't. refused his request to attend the Olympic Games, so Mugabe got in his plane and flew all the way back to Zimbabwe. At the opening ceremony, the Arab and Muslim nations made a pathetic display. Their women were banned or hidden like nuns. In America, men liked watching women's beach volleyball. But the gay men liked watching men's synchronized diving. London will host the 2012 Olympics. Chicago is competing for the 2016 spot, and Capetown, South Africa, is aiming for the 2020 Olympics. The Olympics have never been held in Africa, and it's about time. We saw George Bush and Vladimir Putin sharing the same bleacher seats at the Olympics, while the President of Georgia was planning to move his troops into South Ossetia. Putin took off immediately for Moscow to stage his vigorous military response to the Georgian move. President Bush continued to watch the Olympics -- he loves sports after all. Barack Obama was body surfing in Hawaii, and John McCain was uttering bellicose oaths while the Russian tanks invaded Georgian territory. Obama, emerging from his vacation, advocated restraint.He was thinking along these lines -- We belong to NATO which stands for the North Atlantic Treaty Organization. Then Obama looked at the map, and realized that Georgia was a very long way from the North Atlantic, and so it is not a direct American concern. Meanwhile, right wing radio is thundering, calling Obama spineless. My own opinion is that Obama is right. The principle opponents to Russian expansion are the neighboring countries of Estonia, Latvia, Lithuania, Poland, and the Ukraine. It is their problem and their fight. The European community, led by French President Sarkozy, are the neighboring allies who can back up the stance of the small "frontline" nations. And we, on the other side of the Atlantic Ocean, are the backup to the backup. Bush and McCain are fools looking for a fight if we were to initiate any kind of military response. We can help, but this is not a situation for American leadership. Fir Island is about the best place I ever lived. It’s a delta island five miles across, surrounded by dikes. You could plow it from one to the other because it’s completely flat, and it is plowed for the rich alluvial soil that has filtered down from the Cascade Mountains for thousands of years. The Skagit River built this island, although it could destroy this island at will. The dike broke in the flood of1990 and put the whole island under six feet of water. Those with raised-up houses suffered the least, but it was a big mess just the same, everything caked with mud, and debris all over the place. Living at sea level, we are on the front lines of global warming, so if I tell you that my feet are getting wet, then you’ll know we have a problem. The farms are plentiful. You couldn’t a find rock as big as tennis ball anywhere on this island. The top soil is deep and fine. The water table is just two or three feet below the surface, and the crops get sub-irrigated. We have potatoes across the road from the house. They are blooming their little purple flowers and looking bright from a recent rain. Potato plants aren’t really pretty, but you can’t blame them -- they’re not for looks, they’re for making spuds. The potatoes will be harvested sometime in the fall. They harvest the potatoes last because there’s no hurry. Potatoes, once grown, can sit in the ground for weeks or months with no harm to them. But it is a question of how big the crop will be this year -- the cold, wet spring meant that crops were planted late and will have a shorter growing season. We grow the famous Skagit red potatoes -- smaller, and much better tasting than those honkin’ Idaho spuds. Red potatoes fetch a higher price too. On our side of the road, two wheat fields are golden and ready to be combined. It’s a pleasure to watch the wheat waving in the wind. Right next to the house is five acres of raspberries. What a treat! I go out for a snack every morning. The farm workers have just about finished the picking, and they said it was a good crop. We got invaded by about five hundred starlings at the peak of the crop. Starlings come to plunder and raid -- I can’t stand them. Anyway, they’re gone now -- bothering somebody else. We have a lot of swallows around the house. They are the prettiest, sleekest fliers you could imagine. They come in the spring and build their little mud-daubed nests under the eaves of the house. One nest was right near the kitchen door. And the little eggs hatched, and the little birds stuck their heads out waiting for food -- they had no fear of humans coming in the door, only two feet away. But last week the nest was empty and the little swallows were making their own way in the world. Otherwise, the mama duck still has her brood in the slough behind the barn. The young ducks can fly now, but they still stick close to mama. The herons eat frogs and squawk in the slough. The coyotes are around, plenty of them -- you here them at night, and there aren’t many cats left around this island unless they be house cats. But the coyotes haven’t gotten all the rabbits, because I see them every day. The big cherry tree doesn’t have too many cherries, nor the plum tree, nor the apple tree, I’m not sure why. Last year we had a ton of apples. Snow Goose Produce is a mile down the road going to LaConner. Mike and Mary Louise Rust own that business. I often walk down there just to say hi. I bought a basket from them for $8 -- but they’re not really making a living off of the neighbors, mainly they cater to the thousands of visitors who come up from Seattle and elsewhere -- they sell a LOT of ice cream cones. Going the other way it’s four miles to Conway, a village/town, and there I get on the Interstate to go to work at the hospital in Mount Vernon, another five miles. ---- Best place I ever lived. Personally, I want it all. Keeping your tires inflated is “small ball,” and that works. It’s like getting rich by saving your nickels and dimes -- is that wrong? Nuclear power plants are like a home run swing. That’s okay with me. Recent events show that any energy source is better than getting oil from the Persian Gulf. So, the tire gauge and the nuclear plant frame the energy debate. There are a million choices in between those two ideas. Most of these ideas are good ones, at least worth a try. I believe there is no cost-free source of energy, and usually a toxic side effect, so the best choice is a highly diversified mix. PAY PAL. I’ve added a Pay Pal button on my blog. So if you want to pay the voluntary $25 subscription to Frog Hospital, you choose this convenient method. Subscription income supports the effort and is greatly appreciated. 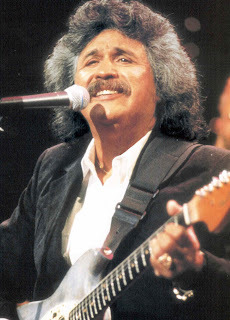 Freddie Fender, the great Tejano singer, was more than a friend to me. This deep-hearted man was my cousin, or the child of my mother’s cousin, Louise Cuny, whatever that relation is. Louise married a Mexican man, in 1930, long before I was born. She moved down to McAllen, Texas, along the border, to be with his people, because my people no longer knew her. It wasn’t like my grandparents to use names, the common racial epithets, but Louise married out, she married beneath us, and we didn’t hear about her. So they never said anything bad about Louise, it was just a closed subject. When I rebelled against my family in the 1960’s, it was because of these secrets. I needed to know about my cousin Louise among other mysteries. I will say now, to interrupt this story, that it was good of my folks to keep their hearts secret from me, for it was not to give too easily, these truths. No, it was for me to struggle and quest for meaning, even the true story of my own family. So, it was not until the late 1980s that I found out about Louise and her child Freddy. Freddy Fender! My God, he sings my soul, “Wasted Days and wasted Nights”, “When the Next Teardrop Falls,” -- those hit songs of his. They were too sentimental -- it was Mexico, it was Texas, it was Tejano. I liked his music too much, because every morning I awoke with a sorrow, a longing for the past which I could not understand. Why was I so old-fashioned to like his music? So it began awkwardly, but he gave me a chair at the club. I sat close by to hear him sing. His life was so different than anything I knew, but I could almost reach him. This was in 1986, when I lived down there. People wondered why I moved to Texas, and why I have gone back there again and again. It was a family secret -- this mixed blood. I could have spoken a long time ago. It seems like nothing now. They don’t even call it mixed marriage anymore, but I was brought up strictly, by the nuns, so I kept that secret. I went back to San Benito, in 2006, to visit Freddie Fender’s grave, and I left my own tears. It’s high summer on the East Coast. The glitterati are enjoying fine wine on the porches of Martha’s Vineyard. The burnished sun sets over sand dunes and water sparkles like diamonds. It’s nice on the East Coast -- Cape Cod, the Hamptons, the Jersey shore. There’s a town and resort place for every income level. The air is ten degrees cooler on the beach. The sand gets in your toes and into the cottage. The barbeque is lit. Friends come over. You forget all about winter. You talk about politics, but casually. It’s no more serious than a game of cards. Parcheesi is popular this year, new herbs and spices, a taste of fennel and basil. The ocean breeze makes you feel young and alive. September is coming. That’s when life changes. September -- not the springtime -- brings new beginnings. Change is in the air. The young people are acting up, but lowering their voices, as if they really mean it. It’s risky. Senator Barack Obama admits to being a risk, but I’ll take the chance. We need to change just to keep things just as good as they are. Wars end. They always have. Civilization is fragile, there are no guarantees. Conservatives guard against the oppression of government over the individual. But I have no trust for any human institution. I fear the government, yes. I fear the large corporations too. I’ve seen corruption in colleges, thievery in small businesses, and brutality in the family, because evil lies in the hearts of men. And we need to change just to keep it as good as it is. Nancy Pelosi, Speaker of the House, gaveled down the Congress and shut off a vote on offshore drilling. Done like a pro, I say. She shut ‘em down, like Tip O’Neil did in the eighties, like Sam Rayburn did in the fifties and like mighty Joe Cannon did a hundred years ago. The Speaker is the boss of the House and not for the first time or the last time. Because Grandmother Nancy enjoys her summer vacation on the West Coast, in Napa vineyards and Big Sur retreats. She doesn’t care to sully her view with the fumes of oil rigs. She said no and she gaveled them down. Rest easy, Nancy. It starts over again in September. Enjoy your balmy days, you great writers, you stars of stage and screen on Martha’s Vineyard, you Nantucket sailors, you clam diggers in Maine, you Jersey gamblers. The rest of us are reading beach novels and eating clam fritters. The days are endless. BEAUTY FROM BROKENNESS is a book about horses, written by Connie Funk, a neighbor and friend. I started reading in the back of the book to see how it ended. I gave it a one day rest, and then started at the beginning like you’re supposed to. It’s a clean, fresh book. Connie writes in a very direct style, she doesn’t play tricks. I don’t believe in new stories. It’s all known, but it comes back around. So I say Connie’s book is fresh. You discover what’s known and been forgotten. You must do this. And listen to God. LISTENING TO AMY WINEHOUSE. I downloaded three of her songs to my laptop, so I’m listening to her as I write. I hate the news and the hype about her. I just want to hear her voice. You can burn your brain out as an artist trying to be something different. Don’t do that. Just be Ella Fitzgerald and Billy Holiday and Betty Carter and Peggy Lee. Just sing. JAZZ. Speaking of jazz, the great American art-form, I wonder what the Obamas like in that kind of music. I can see them at the Inaugural Ball next January, as President and First Lady -- Barack clean and smooth in black and white, Michelle sparkling, but I can’t see what color of dress she will wear, I’m not good at that. Their first dance at the Inaugural Ball -- What tune will the Obamas choose? And this will be a change, a good change, because the Obamas will not choose what the Carters or the Reagans chose. The Obamas will dance to another melody. I have been consulting my Jazz Advisor on the choice of music. I suggested Duke Ellington. My adviser said that Duke Ellington is Presidential but not so danceable. He was thinking more along the lines of Count Basie. What a sweet day that will be. HANDICAPPING THE ELECTION. Obama is the likely winner, by a thin margin. That's his style. There's no way he's going to throw a roundhouse punch at an old war hero like John McCain. He will treat McCain with the same courtesy that he treated Hillary Clinton. Being much younger than McCain or Clinton, he owes them that much respect. In addition, the majority of the voters want Obama to win, but we don't want him to win too big -- on account of his tender age. HORSES AND GIRAFFES. Connie Funk of Dodge Valley has written a wonderful book about horses, "Beauty from Brokenness." She will have a signing at the Next Chapter in LaConner, Saturday, Aug. 16. I got an autographed copy today. I started reading the book this afternoon, during quiet moments at the hospital. I've gotten to page 179 so far. But I'm reading the book backwards, starting with the acknowledgments, which list and describe Connie's friends and advisers in the world of horses, children, gardens, and other spiritual delights. After the acknowledgments, I moved to the left, to the Epilog, which is the last chapter -- the book has a Happy Ending! Then I kept moving to the left, going toward the front of the book one chapter at a time. I'm left-handed -- reading books this way is quite natural to me. Connie is the kind of friend and writer who would completely understand this. Gee, I'm reading this book and I feel like I know the horses she writes about -- That's a joke. I DO know them, one named Chasta and and the other named Gaela, two beautiful horse girls -- I have visited them often. Connie's house is only a few miles from where I live on Fir Island. Then Connie writes about a character named Fred who bears an astonishing resemblance to me. This guy Fred has helped Connie prune the roses, the forsythias, the viburnums, the wisteria, the grapevines, and ESPECIALLY the long lovely privet hedge which marches in twin rows to a bower with a wooden cross, said cross being the original wooden cross on top of the spire of the Sacred Heart Catholic Church in LaConner, built in 1899. The old cross is a little bit weatherworn, but it rests underneath a weeping cherry tree and the sturdy privet hedge shelters it from winter winds. Next to the privet hedge is a giraffe eating fruit from an apple tree. It's a real giraffe, if you mean by that a live giraffe, being a topiary of 8-feet tall, of four cotoneasters, each one being a giraffe's leg, and each cotoneaster carefully pruned up a wire and iron frame, to form the body and long, long neck of a giraffe. "Fred" has often given this giraffe a haircut with his garden shears. There is a dramatic episode concerning this giraffe, a moment of terror and danger -- but I dare not tell, you must read Connie's book. Giraffes, as I have seen them in Africa, are the most romantic of creatures. Their long necks are for nuzzling. Their powerful hearts are a surge of passion. A dull zoologist might point out that the strong heart of a giraffe is necessary to pump blood more than six feet straight up the giraffe's neck in order to give good circulation to the brain. But I say it's love. I watched a scene once, in Hwange Park in Zimbabwe, of two giraffes courting. It was so tender. There were zebras and ostriches cavorting about like ballerinas. But the giraffes lovers held us in awe. It may be, going back again to the very dull zoologist, that the boy giraffe and the girl giraffe have such very long necks and such very long legs, that he is not able to mount her unless she is completely ready, completely willing, and completely cooperative. One cannot rush these things -- as the boy giraffe learned from his forefathers. You must court her, you must dance with her from one thorn tree to another. If you try to force her, you will both suffer. True. And All the Pretty Horses get Sleepy in the Long Summer Days.